Day 2 started with a little trepidation after Mondays flights had been scrubbed. The plan for the day was to join Gouveia on a sort of currency flight, which meant circuits of the airfield (Montijo) simulated engine failures (auto rotations) and also some ground contact training on part of the unused runway at the base and hopefully for a second flight later in the day which would be an evening/night SAR training sortie off the coast. Gouveia left for the briefing whilst I checked over all my photographic gear before leaving for the sortie. I would be shooting with a Nikon D300s, Nikkor 10.5mm fisheye, Nikkor 24-70mm F2.8 & a Nikkor 70-200mm F2.8, I also had my 300mm F4 but as I would be working in close proximity to the helicopter during ground contact drills I didn’t foresee this getting much use. Camera gear checked over and briefing finished we walked out to the cab we would be flying in, the AgustaWestland AW101/EH-101 Merlin, an airframe which allows the squadron to fly long range over the water SAR missions from Montijo their main base and also Porto Santo and the Azores where the Squadron has detachments. Walk around of the cab completed this meant Gouveia could begin the start-up procedure whilst the instructor and winch operator made their way from the Squadrons hangar to the helicopter. Tha vast array of buttons & switches, MFD’s (Muli function displays) FLIR & controls and the flight controls (cyclic, collective and tail rotor pedals) of the AW101/EH-101 are all visible as Gouveia begins the pre flight checklist. Pre flight checklist complete and power running to all three engines we taxied out to the ‘heli pad’ for take-off, a surprisingly smooth experience compared to my flight earlier in the year with 771 Squadron in their Sea King Mk5. Its well worth mentioning the size different in the back of the cabs, the AW101/EH-101 has a lot more room for the flight nurses, winch operators and rescue swimmers to work than the Sea King Mk5, in the latter you would struggle to stand up so would be moving shuffling around on knees primarily where as in the AW101-EH-101 there was more than enough room with 5 POB to move around the cab standing up. From a photography point of view this was also very helpful, it gave me more freedom to move around without hindering the other crew members in the back, especially the following day when all of us would be strapped in by harnesses with the doors open. Ascending to 1000ft to begin our circuits of Montijo I got to have a view of the surrounding area including Lisboa and the river, a beautiful city and seeing it from above only added to that thought. For the shots of the bridge and city I used the 70-200mm 2.8 to give enough reach whilst shooting through one of the bubble windows. Whilst performing circuits of the base I was able to go up to the cockpit to shoot some images with the Nikkor 10.5mm fisheye lens, sadly I hadn’t managed to get my hands on a flashgun before I had left the UK, which in turn shooting cockpit images a little different. This is due to the difference in light levels inside the cockpit which is darker than the outside essentially, to overcome this I was bracketing my exposure with the plan to try and layer mask the exposure for outside in Photoshop, sadly due to constant movement this wasn’t really a good option. Thankfully I found a happy medium between not blowing the highlights too much and not underexposing in the shadows as well, some digital manipulation in Photoshop helped as well. Montijo air base also known as Base Aérea Nº 6 is just visible at the top right hand of the image. After completing circuits it was time for ground contact training, we landed on in the area, which the Squadron and the Navy unit at Montijo use, an unused section of runway, which gives enough separation from the main active runways. Exiting the helicopter from the rear cargo door and ducking down to stay out of the rotor wash I scurried over to the edge of the old runway and got the camera out in preparation for them to lift off again. Switching the 70-200 for the 24-70 on the camera body, made sure everything was secure so that my equipment wouldn’t be seen tumbling off in the distance as they lifted back off. 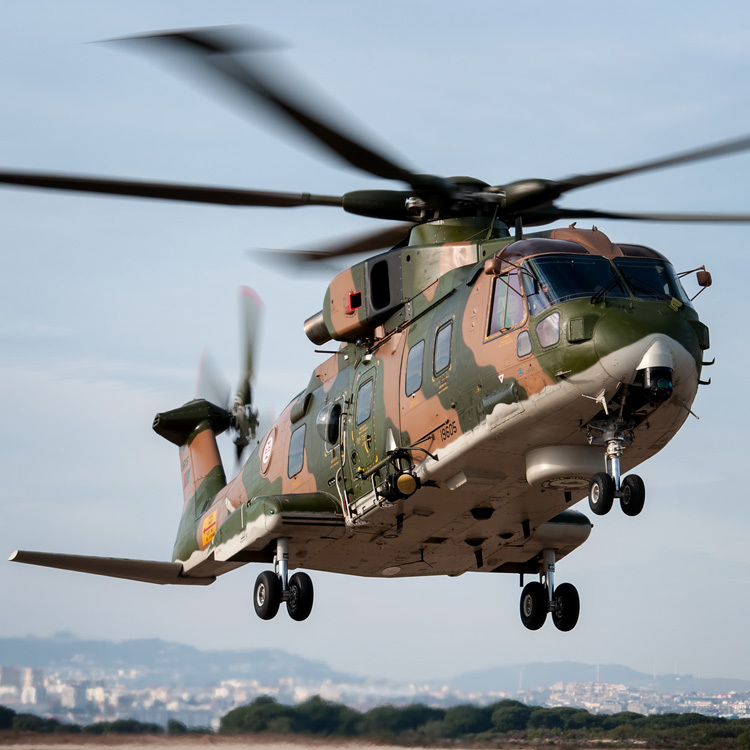 Nothing could quite prepare me for just how fierce the rotorwash/downdraft is from the AW101-EH-101, Gouveia had warned me that it would be pretty bad but I thought after working in close proximity to Chinooks and Sea Kings before that it would just be fairly similar. Well it wasn’t, it also made getting sharp images fairly difficult whilst they were in close proximity to me, I managed to fire of a few sharp frames before taking a knee and waiting for them to slowly edge back down the runway so I could change lenses again, back to the 70-200mm. 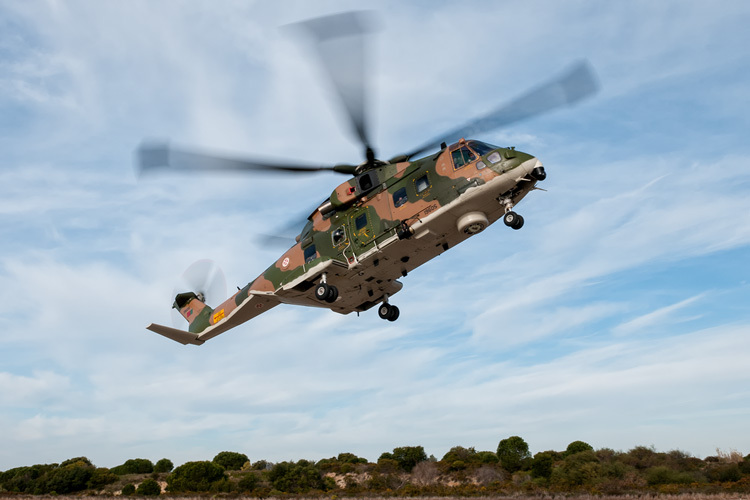 Esquadra 751 AgustaWestland EH-101 Merlin in the hover during ground contact drills at Montijo. Ground contact drills completed and finally some shots in the bag we headed back over to the Squadrons heli pad to be dropped off once again so the crew could head back quickly to complete some auto rotations, as primarily this was a currency sortie for Gouveia who had been away for a month or so. Heat haze from the EH-101 engines blur the vista of Lisboa. Returning back to the Squadrons building we grabbed some food and prepared for the next sortie, an evening SART (search and rescue training) sortie, unfortunately due to the previous days no flying it meant that more winch operators & rescue swimmers needed to be aboard to keep current with their training which ultimately meant I could fly on this sortie sadly. However I would be able to get a shot I wanted from the very start, a night shot of the helicopter lit up with a wet apron. I walked out with Rodolfo & Gouveia to see of the sortie and grab some ground shots as they prepared for take-off, seeing off the sortie essentially. I had the 24-70mm lens for this and was aiming to get a nice amount of rotor blur during the engine run-ups and pre flight checks. Pre flight checks complete they prepare to taxi out as the sun begins to set. After seeing off the sortie we returned to the warmth of the Squadrons building, as it was December the temperatures were still fairly chilly! Gouveia would call up when they were 10 minutes out, giving me enough warning to ready my gear and walk out to photograph their return. Water is sprayed over the EH-101 as the rotors are run up to remove excess water. You can see the winchman at the rear of the helicopter. Waiting near the heli pad I could spot the flashing strobe lights of the AW101/EH-101 in the distance, nearing the pad in the distance the big searchlight came on illuminating the the tarmac and making it impossible to shoot as they approached and landed head on. Slightly worried I wouldn’t be getting my night shot that I had wanted I repositioned myself in the hope that the searchlight would be turned off and they would keep the rotors running when they stopped. They made their way towards the wash area where the helicopters are thoroughly washed down after every sortie to remove seawater and dirt, the member of ground crew immediately started to hose down the helicopter, the crew quickly ran up the rotors to remove the excess water for no more than 30 seconds but thankfully that’s all I needed and I nailed the two shots I wanted. I couldn’t have got better if I’d tried, sometimes its not all about planning but luck and this was one of those moments. That was it for my 2nd day, a long day but I had got my first flight with the Squadron under my belt and had managed to capture some really good images. Pictures & words by Lloyd Horgan.